Read all about it here folks. Our Buddy Sean Croxton over at Underground Wellness does it again. This time, he hits the nail right on the head by targeting the very things which can lead up to sleep apnea & diabetes as well as weight gain. GREAT JOB SEAN. Or is it all just me & my imagination? We’ve all seen the bucket, right? Well now it’s time we see & hear about THE INGREDIENTS that make up KFC’s new Grilled Chicken & the 11 herbs & spices which are claimed to be used, but are apparently so secret that the entire recipe is protected from copycats. Well now, thanks to my newly found friend over at Underground Wellness, WE ARE ABOUT TO EXPOSE THAT…..
Don't believe him? Check out the ingredients (Adobe Acrobat Reader File) & see for yourself. Add to that the Nutrition Information & it's just all the more UNBELIEVABLE that KFC has the AUDACITY to call what they are serving up to be actually "nutritious" & worthy of eating. As a Lap Band recipeint, I can tell you that BOTH of my surgeon's in-house nutritionalists would CRINGE at THE MERE THOUGHT of me trying some of this chicken. Next time I get an irresistable craving for chicken, SOMEONE out there PLEASE talk me into going SOMEPLACE ELSE - Like Church's Chicken perhaps? I say this because it's a SCARY thought to imagine that the words that make up those infamous 11 herbs & spices might actually consist of ELEVEN SYLLABLES in each of them in order to prounounce them. * Next add apricot halves WITH AS LITTLE JUICE AS POSSIBLE & ENJOY!!! FEATURED Toasted Melted Cheese Sandwich. 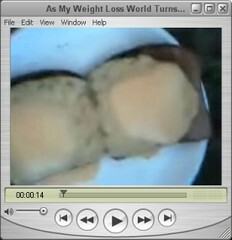 Once the cheese is melted, place the other two slices of toast on top & ENJOY! !